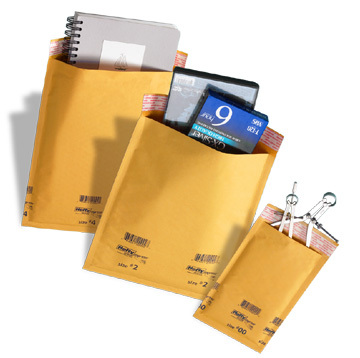 Fast-Pack.com -Bubble Envelopes, Bubble Mailers, Self Seal Air Bubble Shippers - Below Retail Prices! AirKraft Mailers are lightweight yet hold up under the toughest mailing conditions. Air cushioning offers maximum protection. Cases will ship either via UPS or Priority Mail, whichever is cheaper to your zipcode, unless shipping is upgraded by request. All smaller orders (less than a full case) will ship via Priority Mail. Interested in several sizes in small quantities, then call us for a combined shipping quote as our shopping cart only figures shipping breaks on 2 or more of the same product. Combined sizes of envelopes ship via UPS. Shipping Terms - Above listed shipping charges apply ONLY to the 48 Continuous United States. AK & HI email us at fast@fast-pack.com for shipping quotes. E-mail us for Ordering Information or Questions.